CAUTION: When fitting to alloy wheels it may be necessary to use some form of padding to protect the wheel from being scratched. The Heavy Duty Wheel lock will foil the plans of thieves and vandals. Shown here attached to a wheel making it impossible to easily steal your equipment and ruin your day. 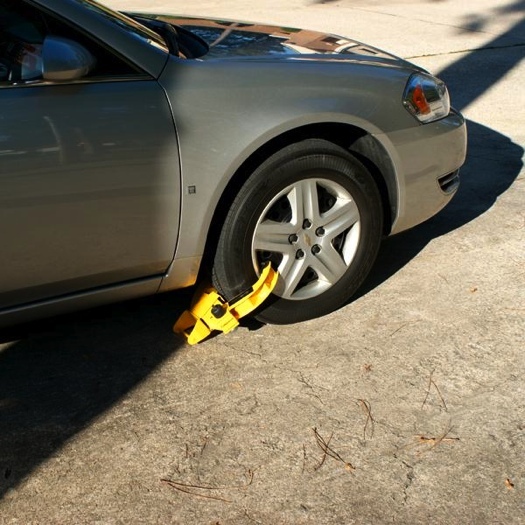 Works just like a Wheel Boot Lock, except you do not owe a bunch of money in parking tickets. This wheel works on everything from utility vehicles and trailers to cars and pick up trucks. Please do not use the wheel boot to play pranks on your buddies!